The Blue Door Art Center Gallery is pleased to present an exhibition of the work of sculptor, Barbara Delany. The show, “Sculptural Journeys”, will open with a reception from 2:00 to 5:00pm on Saturday, September 29, 2018 and will run through October 20, 2018. Barbara Delany’s career as an artist spans five decades. As a painter, sculptor and art therapist, she holds a Bachelor of Fine Arts degree from Cornell University where she was awarded the Fine Arts medal; and a Master of Fine Arts degree in art therapy from the College of New Rochelle. She studied direct carving in stone and wood at the Sculpture Workshop in Riverdale, New York with the late sculptor, Jessica Holden, and carving in marble with the late sculptor, Philip Pavia in Westchester. Her work has been shown in a solo exhibition at the Peg Alston Fine Arts Gallery in New York as well as in numerous group shows in the New York, Washington DC and Westchester areas, with the work winning several awards. Her work is included in private collections in New York, Florida and Washington DC. Barbara’s sculptural work has evolved from casting figurative works into bronze, to carving forms in marble and wood during the 70s and 80s. 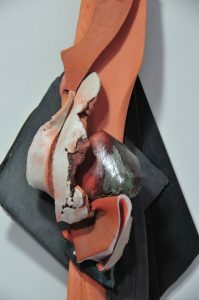 She then discovered the joys of working in clay, and discovered the creative possibilities of discarded objects. Over the past two decades she has combined clay forms and fragments with wood, metal and found objects to create unique wall based sculptures. They are assembled works described as “assemblage”. This exhibition will feature recent works, and will include selected earlier works. Barbara’s studio is located in Mt. Vernon, New York where she resides. This entry was posted in Press Releases and tagged Art exhibit, Barbara Delany, Blue Door, retrospective, sculpture. Bookmark the permalink.